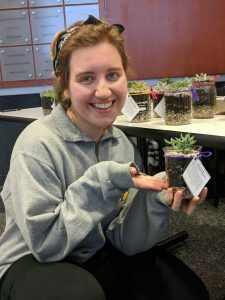 Christiana Kmecheck, a biology and Spanish major, organized the Succulents for Science event. Alpha Chi Sigma, a professional co-ed chemistry, sold succulents in the Chem Building Atrium Monday to help the Madison Metropolitan School District purchase science supplies. For $7, those who donated received a succulent planted in a 400mL glass chemistry beaker. Pictured above, from left: Herbert Durfee IV, material science and engineering; Julie Wessel, microbiology; Yochana Kencherla, neurobiology and psychology; Brenna Bomkamp, neurobiology; Drew Coe, mathematics; Mike Keuhne, chemistry; and Eddie Estevez, computer engineering and computer science.